Because who said to-do lists always have to be so serious and daunting? 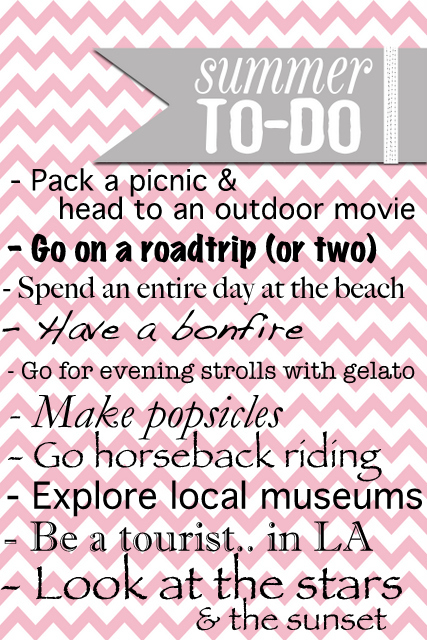 To me, a list that includes trips to the beach and horseback riding is just as productive. Here are just a few of the things I want to make a point of doing over the next two months before classes start back up again. Last summer, we went to an outdoor movie and it quickly topped my list of favorite summer activities. I've already been looking for fun popsicle recipes on Pinterest, and being a tourist in my own city is something I've always wanted to spend a day doing -- just seeing and appreciating things around me in a new light. And it's safe to say I've been secretly planning & dreaming of some weekend roadtrips for quite a while now. If you ask me, all of the items on my list should be obligatory in the summer months..
What are some things you want to make sure to do this summer? My list is always growing, so I'd love more ideas!